Heat therapy is a natural way to alleviate, and often cure, body pain. One desirable aspect to this approach in pain management, is that it tends to ease tension and pain quickly, without medication. Heat therapy is also a user-friendly approach, as it is executed with little to no physical exertion. Another benefit to this method of pain relief is that it can be done on an individual basis (i.e. you can do it alone and without assistance). Heat therapy helps reduce, or remove altogether, aches and pains, especially those occurring in relation to muscle tension, stress, and joint damage. There are several ways heat therapy can help; it can remove stiffness, temper aches and pains, promotes blood flow which speeds up the healing process, and reduce or arrests muscle spasms. Although there are benefits for many people, athletes are probably the demographic that currently takes advantage of heat therapy the most. Athletes are constantly pushing their bodies in search of better performances; an edge over the competition in a way. And while strained or sore muscles can often be addressed by a good round of stretching, sometimes that is not enough. Allowing muscle tissue to move without restriction is the ultimate goal, and stretching, sometimes, can exacerbate some muscle and joint injuries and conditions. Heat therapy, however, can be applied anywhere on the body, free of muscle damage or over-taxation. One oft-used therapeutic method in this regard is a hot tub. 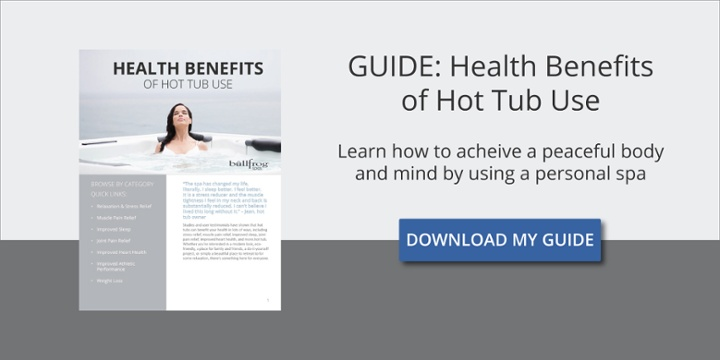 Hot tubs allow a person to submerge their entire body and take advantage of evenly applied general hydrotherapy, as opposed to a heating pad or other localized option. Heat therapy is best utilized after the initial trauma and swelling have subsided. This is usually days after the initial injury. Heat therapy is effective in the treatment of lingering injuries, or to finalized the therapy of almost-healed conditions. It is often recommend that anyone making use of heat therapy also do so before they engage in strenuous work or exercise. In general you are discouraged from using heat therapy immediately following exercise or labor-intensive work. Exciting the sensory receptors of the skin, heat therapy minimizes how often the skin and muscles send pain impulses to areas of the brain controlling such physiological processes. The inevitable result is a reduction of pain altogether. The nice thing about this natural therapy is that it does not simply mask symptoms, it can actually heal damaged areas of the body. Blood circulation is essential in arresting aches and pain, and heat therapy is touted as being perhaps the best at promoting this. As a general rule of thumb, heat therapy should begin not before one day, but no more than two days after sustaining an injury. * Heating pads are a convenient and easily applicable way in delivering heat to specific areas of the body, and so is often the first recommended step. Hot water bottles or hot/warm towels also give the same desired affect. Cancer patients undergoing chemo or radiation therapy stand to benefit from this procedure. Interestingly, healthcare professional are beginning to suggest that heat therapy may actually enhance the affects of radiation therapy. Soaking in a hot tub, in other words, might just help your body fight off that cancer once and for all. Heat therapy is also great for widening blood vessels, which in turn improves blood flow and circulation. A physiological necessity such as oxygen transport, is aided by these newly-acquired gains. All of the aforementioned enhancements work together during the healing process. They also contribute to raising energy levels, and making the cell division and regeneration processes of our bodies more efficient. As a cautionary piece of advice: Persons suffering from heart conditions or diabetes need to consult their physicians before undertaking a heat therapy regimen.